The category B-listed Church of St Paul the Apostle stands on the busy Shettleston Road two miles east of Glasgow City Centre. Jack Coia, of Glasgow architects Gillespie Kidd and Coia, designed the church in an Italian Baroque style, and it was built from 1957 to 1959. Gillespie Kidd and Coia are best known for a significant number of churches in the West of Scotland, designed in their own distinctive style of Corbusier-influenced modernism, all for the Roman Catholic Archdiocese of Glasgow and the Diocese of Motherwell and built during the 1950s, 1960s and 1970s. Jack Coia also designed churches for The Archdiocese of Glasgow prior to World War Two, the earliest being St Anne’s in Dennistoun (1931-33). The bright and airy interior of St Paul’s is lit by large etched glass windows and lined with varnished timber and white marble. The outside is finished in a sombre brown facing brick and the otherwise understated external composition is dramatised by a monumental tower which frames a porte cochere over the main entrance. The church has a very large and active congregation and the car park, which stands between the church and the main road, is often full. The modern hall alongside is heavily used for social functions, both during the day and on most evenings. When a parishioner commented to the Parish Priest, Father John Campbell, that the church and hall appeared empty even when very busy, he grew concerned to address the challenge of making the church’s activities more transparent to those viewing the building from the busy road. 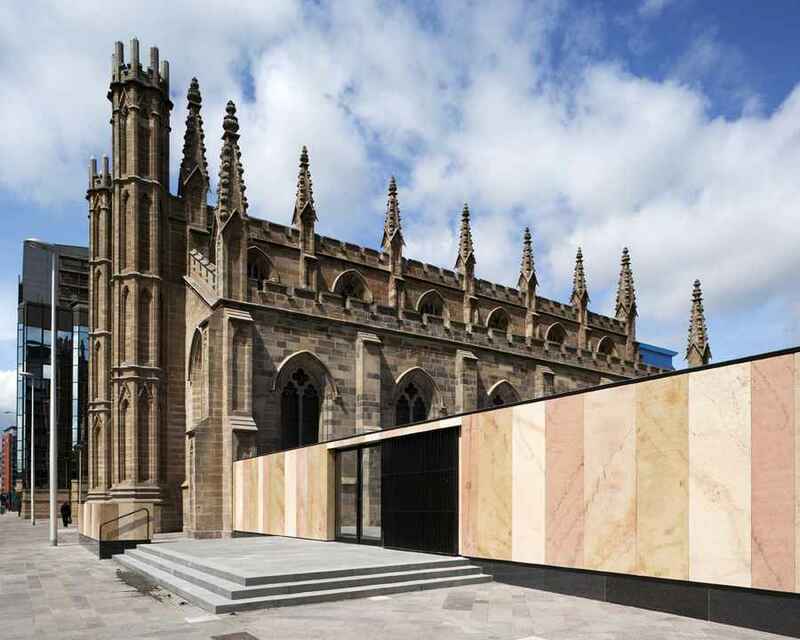 Father Campbell approached Page Park Architects, through the Archdiocese of Glasgow, with the vision of a new ‘glazed cube’ which would clearly show the activities inside. His brief to the architects was to provide an enclosed space, which could serve as circulation linking the church vestibule and the hall, whilst at the same time providing a flexible area where a variety of activities could take place. Father Campbell explained that on the occasion of special masses the long processions, which are formed before passing down the central church aisle to the sanctuary, often needed to be organiszed in the car park, regardless of the weather, because of the limited size of the original church vestibule. Amongst other things the new ‘cube’ was to be designed so as to allow these processions to be organised indoors. Early designs for a new building proposed white external marble wall panels to contrast with the sombre brown brick exterior of the church, and timber-clad internal wall linings to reflect the character of the church interior, all supported by a new steel structure. These features, together with large glazed windows, proved expensive when costed by quantity surveyors. A series of alternative, increasingly simpler and more economic proposals followed until the client and design team finally settled on the scheme, which was put forward for planning permission and listed building consent. 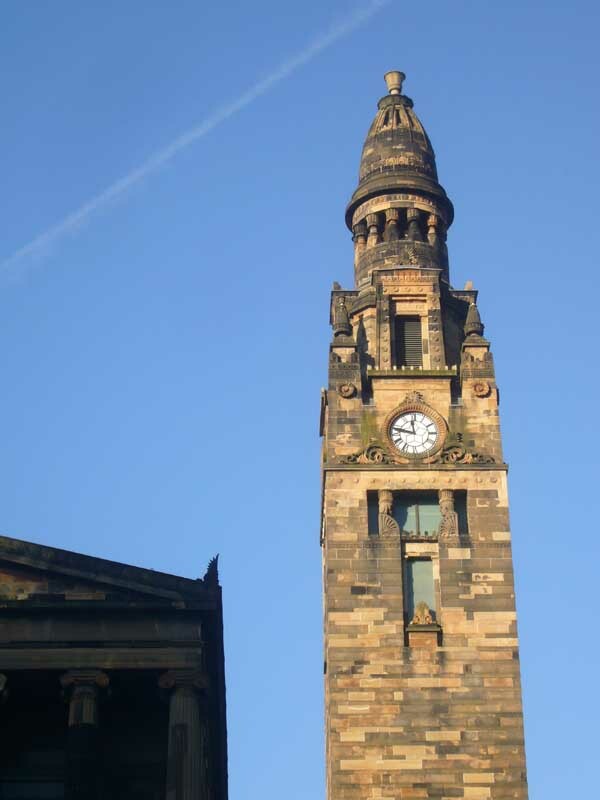 Due to the listing of the church and its prominent location Page Park opened early discussions with Glasgow City Council to ensure that developing proposals would be acceptable to the Planning Department. To assist in the visualisation of the evolving schemes Page Park produced rendered 3D perspectives at all stages of the design development and this helped greatly in finessing the details and reassuring the planners over parts of the proposals that might otherwise have been contentious. While the white frontage was accepted early in discussions the issue of the new building overlapping the front elevation of the listed church was more difficult for the planners to accept. 3D visuals helped to illustrate that the new glazing would allow the section of entire original front wall overlapped by the new building to still to be seen in it’s entirety through the new building. Once statutory consents had been obtained competitive tenders were sought and Glasgow contractor Fleming Buildings Limited was chosen. Works started on site in August 2010 and despite the shocking weather conditions over the winter that followed, the contractor completed the works just prior to Easter 2011 with no major difficulties. 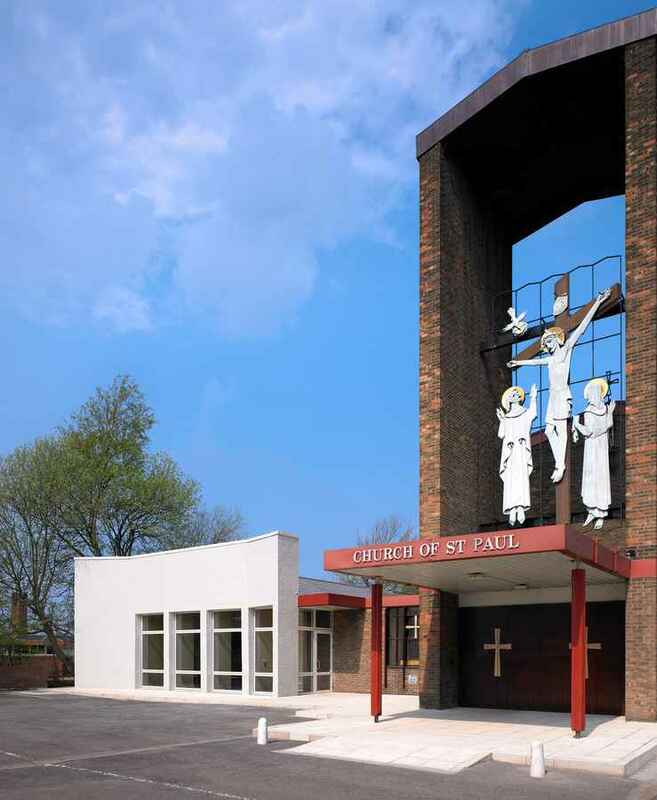 The new building is still affectionately known amongst parishioners as ‘the cube’ despite bearing little resemblance to Father Campbell’s original visual concept. The church are pleased with their new space and were very quick to populate it with comfortable chairs and potted plants. The interior is lined throughout with veneered plywood and enclosed by external masonry cavity walls. The pitched roof is a continuation of that of the church hall and is concealed behind the folded screen of the white brick on the front elevation the simple, angular and planar geometries of which are intended to complement the forms of the original church elevation. The opening formed from the new building into the church vestibule is as large as possible to enable the circulation to flow effortlessly between the spaces but can be closed with new veneered plywood-clad doors when required. 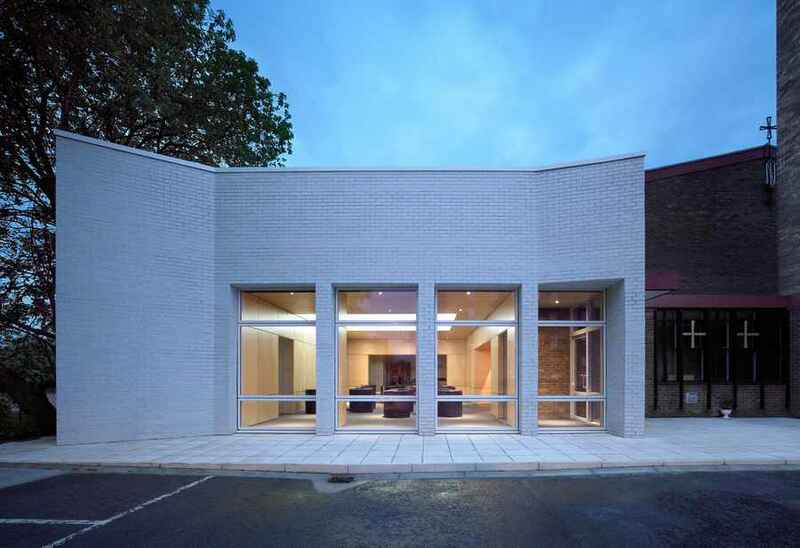 The large front windows and big roof light ensure that the new space is brightly lit even on the dullest days, and external works have given a unity to the church frontage. 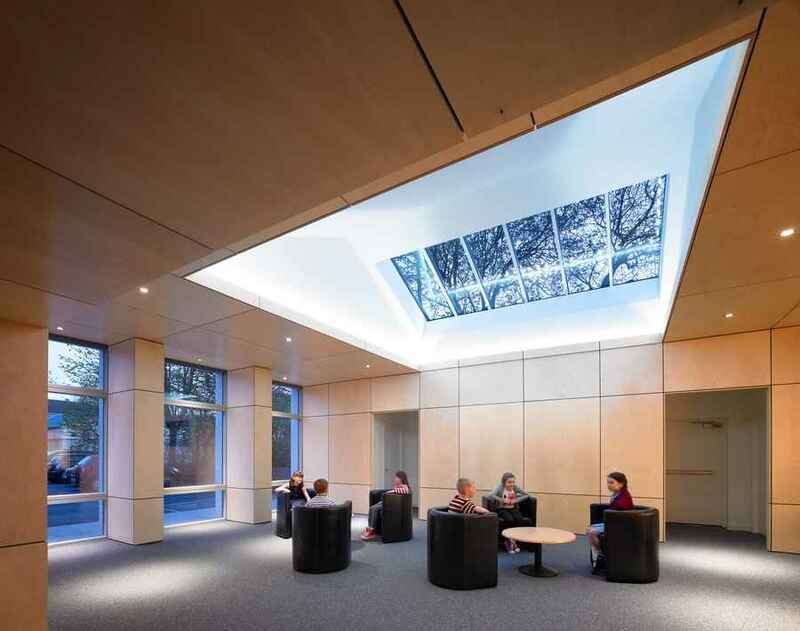 The new extension was recently given an award, in the category of ‘Small Works’, by the Glasgow Institute of Architects. Page Park have, in common with Gillespie Kidd and Coia in their time, a strong and longstanding relationship with the Archdiocese of Glasgow, recently completing major works at St Andrew’s Metropolitan Cathedral, and it has been a source of great pride to the practice, when working at the Church of St Paul the Apostle, to have had the patronage of the Archdiocese and the opportunity to contribute to the historic legacy of Glasgow’s finest modernist architects.